The Red & Purple Lines begin at Hamley's. The Blue Line begins at Old Town Square. However, customers can join the tour at any of the tour stops along the route. Castle Walking Tour - Join the tour at Prague Castle (Stop 4). Jewish Quarter Tour - Join the tour at Tourist Information Office, Zelezna. For the boat tour, board the boat at Dock/Pier 5, Beside Czech Bridge. At the 'end' of the tour, the bus will return to the first departure point. Prague Castle - 11:25, 12:55, 14:25. Join this tour at Stop 3 along the Red Line. Jewish Quarter - 10:45, 13:00, 14:45. Join this tour at the Tourist Info Office. Being 20 weeks pregnant I wanted a way for me and my husband to have easy reach to all local attractions. This didn’t disappoint and the boat trip was a great way to see Prague by water. Enjoyed being able to hop on and hop off the tour and decide how long we wanted to stay at each site. The cruise during the day was very enjoyable. Great tour. If you can afford it, you may want to look into one of the dinner cruises. Wonder if they offer this during the winter because it would be beautiful. 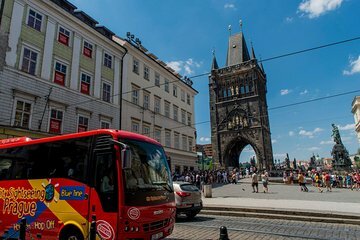 Habitué aux circuits Sightseeing j'ai trouvé celui de Prague mal organisé: il n'y a aucun repère pour les différents arrêts. L'option visite du château de Prague est nulle: elle ne permet que la ballade guidée dans le château sans donner accès aux différents monuments; il faut payer en plus les entrées à chaque monument.